COLD NIGHT AHEAD: As expected, today is breezy and much colder across North/Central Alabama. We saw some low 80s at this time yesterday; Cullman and Haleyville are at 39 degrees at mid-afternoon today. Most communities are in the 40s, and with a clear sky and diminishing wind tonight temperatures will drop pretty quickly. We project a low in the 25-29 degree range early tomorrow morning. 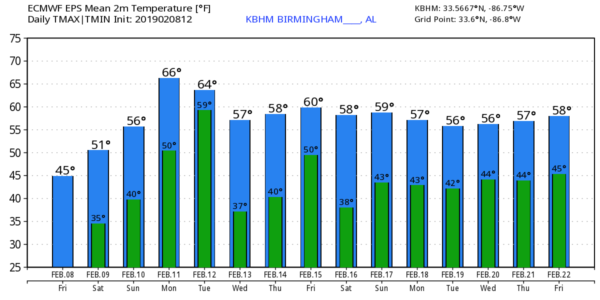 THE ALABAMA WEEKEND: Tomorrow will be dry with a partly sunny sky… the high will be in the mid 50s. Clouds will increase tomorrow night, and Sunday will be mostly cloudy with potential for a few scattered showers. Nothing widespread or really heavy; Sunday’s high will be in the 50-55 degree range. A warm front will push northward through the region Sunday night. NEXT WEEK: Monday will be mostly cloudy and warmer with a few scattered showers… temperatures will rise into the 60s. Then, rain is likely on Tuesday with a cold front approaching. Some thunder is possible Tuesday, but no severe storms are expected with very little surface based instability. Wednesday will be dry with a good supply of sunshine along with a high around 60. Clouds increase Thursday, and we will have periods of rain Thursday night and Friday. No sign of any issues with flooding, severe thunderstorms, snow, or ice for Alabama for the next 7 to 10 days… see the Weather Xtreme video for maps, graphics, and more details. I had a great time today visiting the students at Glencoe Middle School; be looking for them on the Pepsi KIDCAM today at 5:00 on ABC 33/40 News! My next Weather Xtreme video will be posted here Monday morning by 7:00… enjoy the weekend!